What is a Daily Chart in Intraday Trading? What is the daily chart? Daily chart in stock market – First of all we will try to explain the meaning of chart, Charts plot historical data based on a combination of price of the stock, trading volume of the stock with time intervals. Chart will tell us the movement of price through time and vertical & horizontal measures. Charts also represent filled buying order and selling order of that particular time in the share market. A Chart can be a Daily Chart, Weekly charts as per the time frames. This Different Time frames are us for Different trading styles and techniques of day trading. Also Read: What are the best indicators for swing trading? There are several type of charts but here we will discuss the popular charts which will help us for Intraday Trading in NSE market . 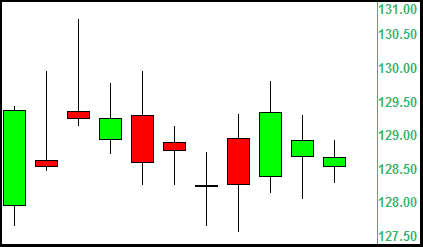 Candlesticks charts is way of showing information about how price is moving for a particular stock in NSE market. Candles in a charts refer to the information for a specific time. 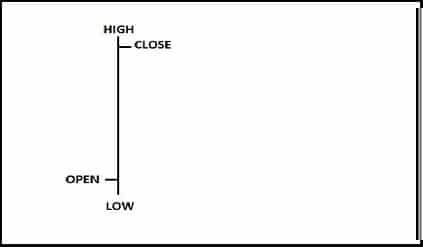 For examle, in daily chart each candle represents one day and that will show the open, close, high, and low price for that given day. This chart will give information about demand and supply equation for the day trader. In the below example a Red colour Candle is Bearish while the Green color candle is bullish candle. Candle stick charts shows the actual “market sentiment”: whether the bears or bulls were in control, and how far traders managed to push price in both directions. Bar Chart is one of the basic tools of technical analysis while doing day trading. In a Bar Chart the open, close, high, and low prices of stocks or other financial instruments are embedded in bars which are plotted as a series of prices over a specific time period. Bar charts are often referred to as OHLC charts (open-high-low-close charts) to distinguish these charts from more traditional bar charts used to depict other types of data. Bar charts allows traders to see patterns more easily. In other words, each bar is actually just a set of 4 prices for a given day, or some other time period, that is connected by a bar in a specific way—hence, it is often referred to as a price bar. A price bar shows the opening price of the financial instrument, which is the price at the beginning of the time period, as a left horizontal line, and the closing price, which is the last price for the period, as a right horizontal line. These horizontal lines are also called tick marks. The high price is represented by the top of the bar and the low price is depicted by the bottom of the bar. The ups and downs pattern in a share market tells a very specific story about the battle being waged between bulls and bears. 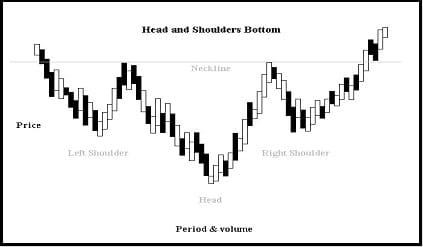 In technical analysis, a head and shoulders pattern describes a specific chart formation that predicts a bullish-to-bearish trend reversal. After a long bullish trends in a specific stock, the price of the stock can rise to a peak and then come down. The price of the stock rises again to form a second high substantially which is above the initial peak and then the price of the stock declines. 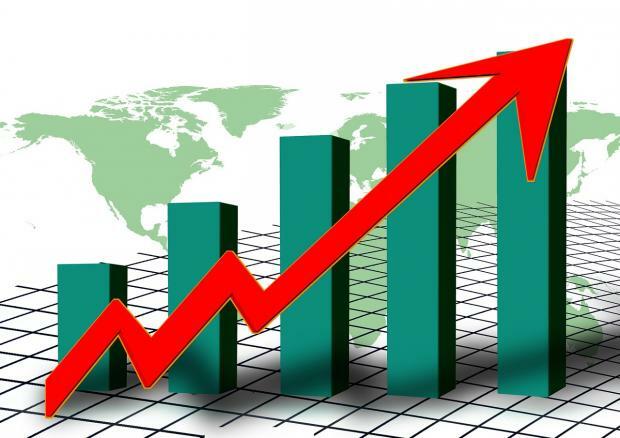 The price of the stock rises again for third time at the same level where the first rise had made the high and again the stock starts falling from that level. Once you see this type of movement in the stock, you can predict that a trend reversal is about to happen and short sell the stock at this levels to gain money. Head and shoulders Top : Bearish chart from the top stock will go down. Head and shoulders Bottom: Bullish pattern chart The stock will go up from the down price. There are lot of other charts patterns like Double Top Reversal, Double Bottom Reversal, Falling Wedge, Rising Wedge, Rounding Bottom. Etc which a trader should learned to master the day trading in NSE market. Here we cover the basics about daily chart for day traders. Reading Daily chart will surely help you maximize your gains for Intraday Trading. Daily chart will give the signal what time to buy, at what price to buy and finally when time to sell or square off the position. Also Read: What is a good RSI number?